It is a cloudy, windy, somewhat chilly autumn day in Connecticut, and I'm trying to motivate myself to go outside and continue work on the multitude of ongoing projects carried over from the summer as well as the recent grand ideas I wish to accomplish before it gets too cold to work outside. We had our first frost a few nights ago, and while it didn't kill everything outright, the damage it did leave was enough to make the garden look a bit dreary. Coincidentally, I've had a couple of people ask me if it is now time to clean up the garden — but that can be a bit of a loaded question, because garden cleanup can encompass many things. For my neighbor, every nice day seems to be a good day for creating noise pollution and blowing leaves around his property. For me, leaves gathering on the property is less of an issue. Certain garden cleanup tasks can and should be completed now, such as cutting back irises to prevent the iris borer from settling in over the winter. Some plants, such as summer-blooming anemones and feverfew, lost their luster a while back, so I don't feel bad cutting them back to the ground. Anything that is diseased has to go, including leaves that might have a fungus problem. If there are areas that have heavy vole activity, then it's best not to provide them with leaf cover to "cover their tracks" underneath the winter snow. And obviously, if there are large perennial plants that need cutting back along walkways, that has to be done, too, because that can become a hazard when snow arrives later in the year. But it's important to leave some plants standing, and the reason is that I do want to create a safe haven for the native bees that need to overwinter in the garden. I do try to leave standing the plants with hollow stems, and remove them in the spring instead. For example, I leave up echinacea, not only because the seed heads feed the birds, but because they also provide those hollow stems. When we first became homeowners, we were already conditioned to not only clean up the fall leaves but remove them from the property in leaf bags. This is just what you do in suburbia. 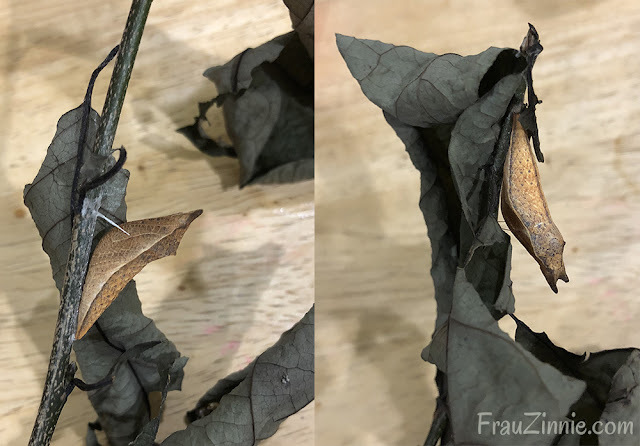 Not only did packaging the numerous brown paper bags take so much time, but we were actually doing a disservice to the insects we wanted to keep on the property, such as butterflies and moths whose chrysalises look so much like the leaves we were raking up and disposing of. The chrysalises of spicebush swallowtail butterflies mimic the leaves on the spicebush plant. They stand out more in these photos since I cut the branches with leaves and brought them inside for the then-caterpillars to eat. There's a learning curve as you evolve as a gardener. I grew up thinking blue chemical fertilizer is what my plants needed, and that dyed mulch was a cool thing (both of these I now grimace at). The reason for this could partially be the time period I grew up in (organic gardening was a smaller movement in the '90s) combined with the in-your-face marketing at big box stores. What's the result of this go with the flow mentality? Basically my property can look a bit wild as it advances into winter. Eventually snow knocks most of it down. Luckily I live in an area where my town doesn't enforce crazy rules about what a front yard should look like. One of the things I value most about my garden is the life that it sustains, and if you want to see those butterflies and bees next spring, you have to make sure it's accommodating during the months you wouldn't expect to see them. You don't need to change your ways all at once. Figure out what you are comfortable doing, whether it's leaving a patch of leaves under some shrubs or leaving an area for some plants to be left standing. Every little bit helps, and that does make a difference. 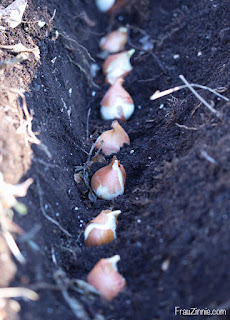 Instead of spending time bagging leaves, think of all that time you will get back for tasks you do enjoy, such as planting spring-blooming bulbs, which can bring so much joy next April when winter has lingered for far too long. Lucky for me, the sun has returned, so back out in the garden I go.